Dana Michel will come to Davis to talk about her work Yellow Towel. 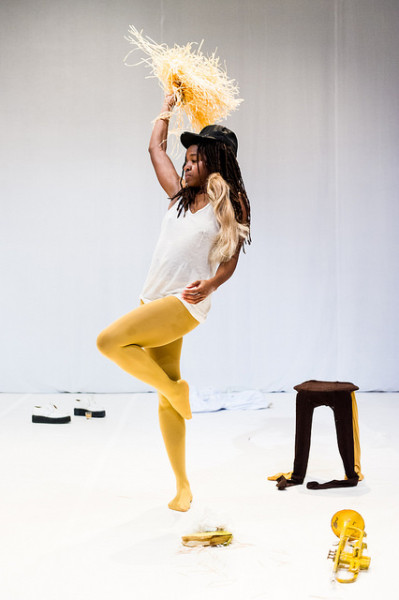 Dana Michel will discuss her complex performance work Yellow Towel and its explorations of race, gender, body politics, and their intersections. As a child, Dana Michel would drape a yellow towel on her head in an attempt to emulate the blonde girls at school. As an adult, she now revisits the imaginary world of her alter-ego in a performative ritual free of cover-ups or censorship. Blending austerity and absurdity, she digs into black culture stereotypes, turning them inside out to see whether or not she can relate. We witness her allowing a strange creature to emerge from this excavation in a slow and disconcerting metamorphosis that we follow with fascination. Strongly influenced by the aesthetics of fashion, music videos, queer culture and comedy, Dana Michel quickly stood out as an emerging dance artist. With Yellow Towel, which was developed in Vienna, Brussels, New York, Toronto and in Montreal, she explores new creation territories and most decidedly asserts herself as an artist to watch. A figure of the Montreal underground scene well worth discovering. (Source : Fabienne Cabado). We strongly suggest seeing her show FEB 13-14, SAT at 8:00PM, SUN at 7:00PM at Dance Mission in San Francisco.